Don’t waste another minute looking for the perfect Valentine’s Day Dinner spot. Whether you’re looking for special restaurant to celebrate Valentine’s Day with your partner, or a place to take the whole family to share a delicious meal – Bella Italia Ristorante in Winter Garden has delicious Italian food perfect for the occasion. 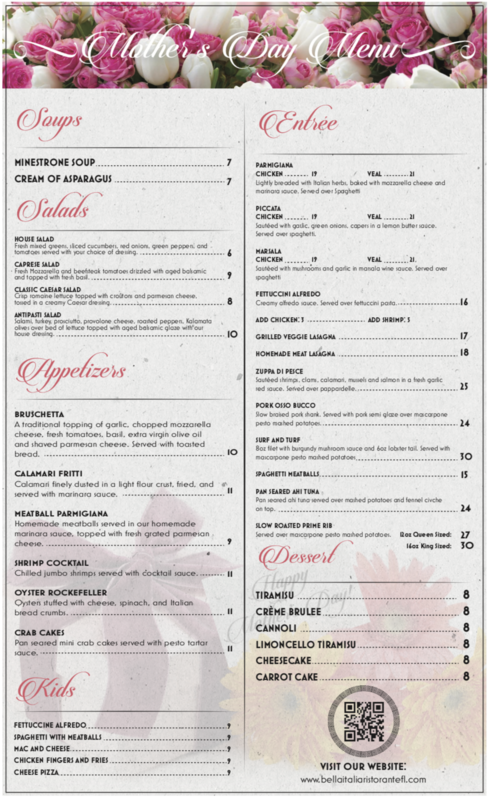 Below, you’ll find our special Valentine’s Day menu. Please call us to make reservations. 407-347-3277. Piccata: Chicken 19 /Veal 21 – Sautéed with garlic, green onions, capers in a lemon butter sauce. Served over spaghetti. 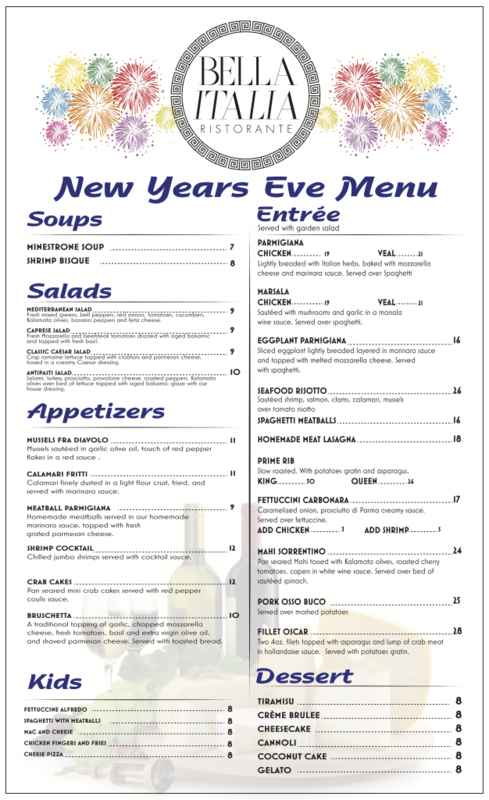 Gather the family and friends for a special New Year’s Eve dinner at Bella Italia Ristorante. 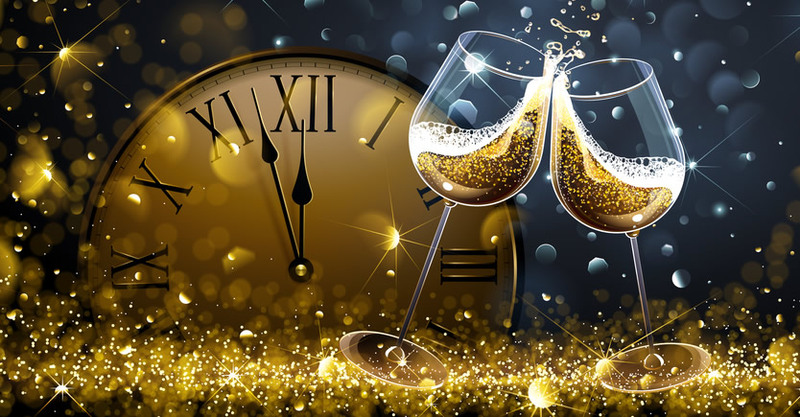 Ring in 2019 with Bella Italia Ristorante. We will be hosting a special New Year’s Eve dinner on Monday, December 31, 2018. Please call ahead 407-347-3277 for reservations as space is filling up quickly. Gather up your friends and family for a special evening to mark all that 2018 brought your way, and to look forward to 2019’s events. We will be open that day from 11am-9pm. Celebrate Christmas Eve with a delicious Italian meal surrounded by friends and family in a beautiful, festive setting. Once again Bella Italia Ristorante will be hosting a special Christmas Eve dinner on December 24, 2018. We will be open from 11am-9pm and taking reservations for anyone who would like to dine with us that evening. 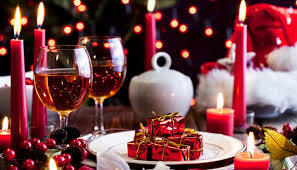 Please call ahead to the restaurant at 407-347-3277 to reserve your Christmas Eve Dinner spot. We are excited to serve you and celebrate this very special time of year with delicious Italian food. Our full menu for Christmas Eve is listed below. Bella Italia Ristorante will be closed Christmas Day. Searching for a special place to treat mom this Mother’s Day? Look no further than Bella Italia Ristorante, an authentic Italian restaurant in the Winter Garden. 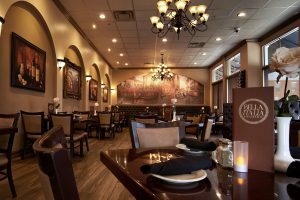 Nestled in Winter Garden neighborhoods, bordering Windermere, Bella Italia is a favorite among locals and has won over the hearts of many discerning palates. This Mother’s Day we will be serving from a set menu* on Sunday, May 13th. 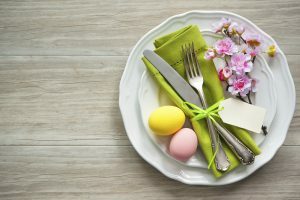 We are open from 12pm – 9pm that day and will be taking reservations for families of six or more looking to dine with Mom. We will have LIVE music from 4:00p to 9:00p to make the atmosphere even more special. Please call us to reserve in your table as soon as possible: 407-347-3277. *The set menu will be the only menu served all day. Take out orders will also be restricted to this set menu to make sure we can accommodate all requests during what is to be a busy, and special day for all. We will once again be hosting a wonderful holiday lunch with a special menu to celebrate. Please join us from 12pm-9pm for quality authentic Italian food in Winter Garden. House Salad – Fresh mixed greens, sliced cucumbers, red onions, green peppers, and tomatoes served with your choice of dressing. Caprese Salad – Fresh Mozzarella and beefsteak tomatoes drizzled with aged balsamic and topped with fresh basil. Piccata: Chicken /Veal – Sautéed with garlic, green onions, capers in a lemon butter sauce. Served over spaghetti. Zuppa di Pesce – Sautéed shrimps, clams, calamari, mussels and salmon in a fresh garlic Lemon butter sauce or red sauce. Served over spaghetti. Roasted Duck – Half roasted duck served with blood orange reduction sauce. Served with roasted potatoes and asparagus. 15% of sales on 12/20/17 will be donated directly to GKTW. Every year, Bella Italia Ristorante selects a local charity to support during the holiday season. This year we have partnered with Give Kids the World Village, a nonprofit resort in Kissimmee, Florida for children with life-threatening illnesses and their families. 15% of all sales on Wednesday, December 20, 2017 will be donated to this wonderful organization that supports families faced with the unthinkable. We will have LIVE holiday music from 6-9pm. The Bella Italia Ristorante team hopes that you’ll plan to dine with us that day and support our efforts. Bella Italia will be open from 12-8pm on Thanksgiving Day. Bella Italia Ristorante will be open from 12-8pm on Thanksgiving Day 2017. 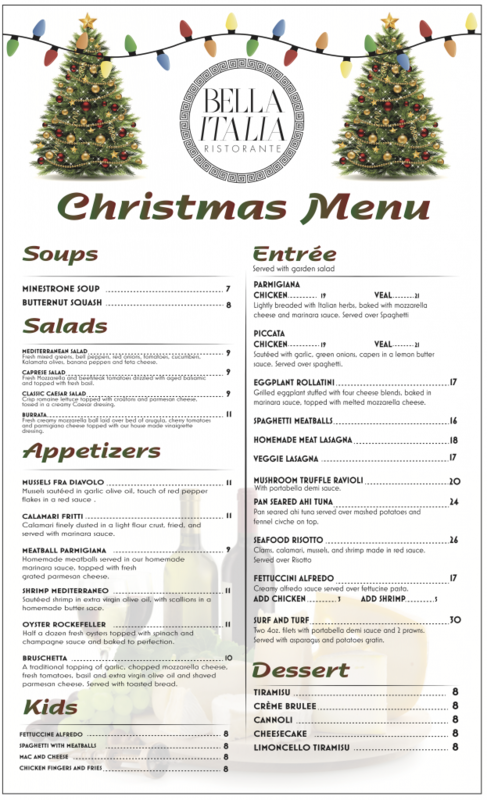 We will be serving a large selection from our regular menu as well as a traditional holiday meal. For $25 for adults, and $10 for kids 12 and under, you can choose from turkey with cranberry sauce or ham and all the sides including stuffing, green beans, mashed potatoes, sweet potatoes, and pumpkin pie for dessert. Please call for reservations 407-347-3277. You can visit our Facebook page for more information. Caprese Salad $ 10 Fresh Mozzarella and beefsteak tomatoes drizzled with aged balsamic and topped with fresh basil. Mediterranean Salad $ 9 Fresh mixed greens, bell peppers, red onions, tomatoes, cucumbers, Kalamata olives, banana peppers and feta cheese. Piccata Chicken $ 19 / Veal $ 21 Sautéed with garlic, green onions, capers in a lemon butter sauce. Served over spaghetti. Zuppa di Pesce $ 25 Sautéed shrimps, clams, calamari, mussels, and salmon in red sauce. Served over spaghetti. Please feel free to contact us with any questions you may have. Our goal is to provide the best customer service possible. We sincerely appreciate any written comments you have about our food. We currently only take reservations over the phone. If you would like to book for a party of 8 or more, or simply want to make sure we have a table ready for you, please give us a call and we will do our best to help. For groups and catering, we require a minimum of 24-hours notice.